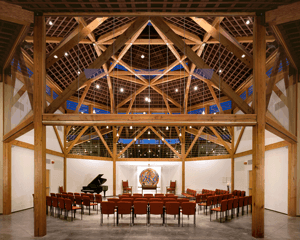 Congregation Beth Shalom Rodfe Zedek (CBSRZ) in Chester, Connecticut is devoted to living and teaching our Jewish heritage, while offering opportunities for spiritual, intellectual and personal growth. To the joy of Jewish tradition and values, we add spice, passion, and innovation. Our name, “Congregation Beth Shalom Rodfe Zedek” carries layers of meaning. The name is long because it incorporates the names of two original synagogues in the lower Connecticut River valley which merged into one. “Beth Shalom” means “House of Peace,” and “Rodfe Zedek” means “Pursuers of Justice.” We try to live up to these names in all that we do – bringing peace and wholeness to our spirits and never ignoring our call to heal the brokenness of the world. Over the years, CBSRZ has also become a center of cultural life for the lower Connecticut River valley, drawing eminent authors to its Books & Bagels program and world-class musicians to its Music & More series. At the heart of our community is this ethic: that every resource required by a Jewish family – including interfaith families and LGBT families – is available at CBSRZ. For parents of young children, we provide a chance to do their part to honor the work of their ancestors, by passing along our rich traditions. And for those who may have lost touch with Judaism over the years, we open the door to for rewarding reentry and opportunities to help keep the light of our faith alive.